Investing in stocks can be brutal. According to research, the S&P 500 lost at least 10% from a previous high every two-and-a-half years on average, and at least 20% every six. A 30% loss happened every 13. It has fallen 50% from a peak three times since 1954. Remarkably, losses of this magnitude contradict the models we use to describe market behavior. For example, the largest S&P 500 one-day loss was 20.5% in October 1987. According to a widely used model of stock market returns (which assumes they form a bell curve around an average), the likelihood of the 1987 loss is roughly equivalent to picking the right card in a deck with as many cards as atoms in the known universe. In other words, that loss could not have happened. Clearly the problem is not that impossible events happen; it is rather that our models are inadequate, and a lot of analysts have tried to come up with better ones. So far, this quest has proven fruitless. We still can’t predict markets with any meaningful accuracy. This is why markets are not so much like the weather, but rather like earthquakes, which scientists now admit are unpredictable. There are some very basic reasons why limiting losses is more important than producing strong returns. A well-known example goes like this: If you lose 50% of $100 you need a 100% return on the remaining $50 to break even. This means that a large percentage loss requires a very large percentage gain for full recovery. This is even more important for retirees who use savings to pay for living expenses. For example, taking $10 after a portfolio falls from $100 to $50 leaves the saver with only $40. A subsequent 100% return only takes the portfolio back to $80. That means that the $10 withdrawal turned into $20 because of its bad timing. But when $100 only falls to $80 and $10 are taken, a subsequent 25% recovery on the remaining $70 brings the value up to $87.50. This means that the $10 withdrawal turned into $12.50—a much smaller penalty for taking money out at the worst possible time. 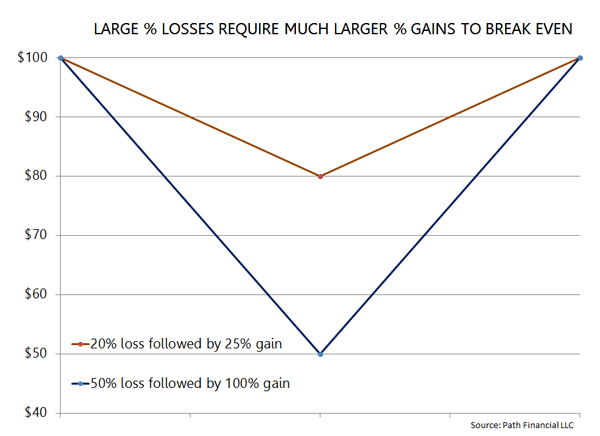 The moral is clear: limiting losses is an essential element in portfolio management. Adapting portfolios to market conditions requires dedication, patience, and a well-designed set of rules. This is, or should be, the professional portfolio manager’s job. Some investors insist that the portfolio manager’s job is simply to beat the market by picking a high proportion of winning assets. Accordingly, they are willing to pay a premium for those managers who seem to have the hot hands. This is a bad approach, commonly known as “chasing past returns." Many studies show that virtually no active fund can consistently beat its benchmark, and not because of fees. According to Standard & Poor, which publishes a regular analysis of fund performance, most funds underperform their benchmarks both before and after fees. While limiting downside exposure is crucial in portfolio management, having this protection in place at all times can be frustrating. If the market keeps on rallying, the “insurance" against declines may appear to be an unnecessary drag on returns, just as going through the expense of building a house that is earthquake-resistant may seem like a waste as long as there are no earthquakes. We have all complained about paying for insurance that we don’t seem to need. This is understandable as long as disaster does not strike. But the temptation to cancel insurance can be dangerous. If you are not yet convinced this is so, please reread the first paragraph to see why having a systematic process to protect investments from losses is a good idea.